Market slated to kick off in mid-March. 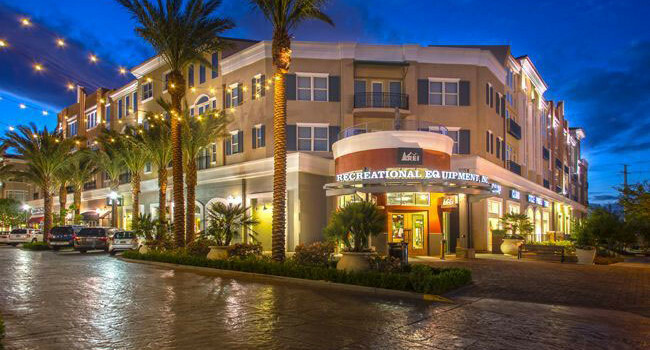 The District is located within Green Valley Ranch, a leading master-planned community located in the Black Mountain foothills, about 10 miles southeast of the Las Vegas Strip. Phase one of The District was developed in 2004 and encompasses 212,622 square feet of retail and office space on the west side of Green Valley Parkway. The 21.54-acre property is comprised of 50 national and regional stores and restaurants; 88 luxury condominiums; and complementary office users. The shopping, dining, entertainment, residences and office space are joined via a pedestrian-friendly main street plaza and a central park. Phase one is 85 percent leased to several high-profile tenants including REI, Pottery Barn, Anthropologie, Williams-Sonoma, Ann Taylor Loft, White House/Black Market, King’s Fish House and P.F. Chang’s. Phase two of The District was developed in 2006 and totals 171,485 square feet on 16.02 acres. The property consists of six buildings with a retail and office tenant mix. Phase two is 82 percent leased, anchored by Whole Foods and also including tenants such as West Elm and The Cheesecake Factory.